As you have heard through the national media, please pray for the victims of the recent tornadoes in the last two weeks — an EF-4 in Granbury, TX, (near Fort Worth) on May 15th, and now an EF-5 in cities near Oklahoma City. We’re sure there will be a Connectional Church effort to help, but here is some information for those who might want to assist now as well as later. The Oklahoma City Red Cross will open shelters as first responders assess damage. The organization says in the immediate aftermath, the best way to help is to donate at RedCross.org or text REDCROSS to 90999. The Salvation Army has mobilized a number of emergency relief services in Oklahoma, including Moore, to dispense food, hydration and emotional support to first responders and survivors. Donate online at www.donate.salvationarmyusa.org or text STORM to 80888 to contribute $10 to the Salvation Army’s relief efforts or make a donation via phone at 1-800-SAL-ARMY. 1) The Conference Lay Organization’s annual Soup to Nuts Scholarship Fundraiser will be held THIS Saturday, May 25th, 1:00-5:00 PM. Hosted by Columbia churches, it promises to be a wonderful opportunity for fellowship, education as well as a meal. Tickets are $10 and are available from your local Lay President, or contact the Chair, Bro. Oliver Goodman, 931-840-9989. 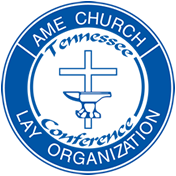 2) The quarterly meeting of the Conference Lay Organization will be held on Saturday, June 15 at 9:45 a.m. at the seat of the North Nashville District’s Church School Convention. The location of the meeting is the First Assembly of God, 3525 U. S. 70, Dickson, TN 37055. The Church School Convention is being hosted by St. James AMEC, Dickson, Rev. Jeffery Norfleet, Sr., Pastor, Rev. W. Antoni Sinkfield, Presiding Elder. 3) The South Nashville Church School Convention will also be held on Saturday, June 15 at Greater Bethel AME Church, 1200 South Street, Nashville, Rev. Michael Broadnax, Pastor, Rev. Roderick Belin, Presiding Elder. 4) The TN Conference WMS will hold its “Savor the Flavor” on June 23rd from 12 noon – 3:00 PM at Greater Bethel, Nashville. Donation, $20. 2) Praise God for Rev. Randall Webster‘s graduation from Payne Theological Seminary with a Masters of Divinity degree! Expressions may be sent to him at rndllwebster@yahoo.com. 1) The 16th annual Convention of the 13th Episcopal District Lay Organization will be hosted by the Tennessee Conference Lay at the Doubletree by Hilton, 1850 Old Fort Parkway, Murfreesboro, TN, Thursday night, June 6-Saturday morning, June 8th. 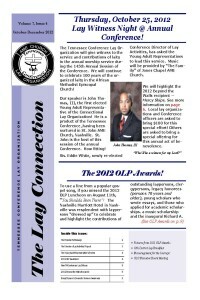 For more information, contact your local lay President, or the 13th District Lay President, Sis. Dorothy Ealy, dorothylealy@bellsouth.net. 3) The 13th District WMS will hold its Pastors Appreciation Luncheon on July 1, 2013 at the Holiday Inn, Bowling Green, KY, honoring pastors from across the District. Pastors are asked to submit a short bio. Tickets are $40.00. 3) The Connectional Music and Christian Arts Ministry (MCAM) Conference will be held, July 9-12 at the Holiday Inn Chicago Mart Plaza, 350 West Mart Center Drive, 312-836-5000. For more details, please visit the official AME Church website, www.ame-church.com. **Getting the Word Out is an initiative of the Tennessee Conference Lay Organization as an effort to keep everyone informed of news and events of all of the components of the Tennessee Conference in a timely manner. It is published as needed. To submit information, please send to pyholmes@aol.com. If you want to be removed from this distribution list, please reply to this message. Please, click on the image to view this publication! Thank you and enjoy this issue!